"Let's go see the garden" Patrizia walks us down a steep mountain path. I completely fell for her from the first sight. Gorgeous at her sixties she was harmony itself. Married to Enzo, the head of Barbieri family, hostess of the kitchen of the family hotel, mother of three adult children, many times grandmother, she was always shining with genuine care for each and everyone around her. My lovely friend Alina brought us to Barbieri hotel this August. "You just have to meet her" she said, and as soon as I saw Partizia I knew exactly why. We instantly started thinking about bringing a cooking tour there. She cuts up a few branches of cherry tomatoes - "Let's make some salad for dinner tonight". Look at these babies - her little zucchinis and aubergines are totally cute - "We always pick our veggies still small while they are still so flavorful and tender". Figs are very late this year, but she still finds three ripe berries for us. They are so sweet and melting. "Trees down there are walnuts, will get ripe in the autumn". "And that's pomegranate - also not yet ready". We take the tomatoes and return to the kitchen. Fresh pasta is very important in Barbieri family cooking, though for Calabria it's far from typical. That's because while Enzo was born in Calabria, Patrizia originates from Emilia-Romagna. 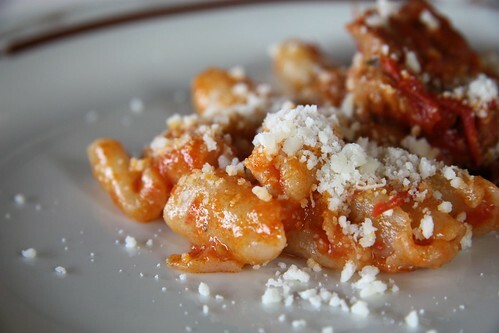 She shows us how to make conchiglie shaped gnocchi of her special dough by hand. "Bravissimo Maria!" - she sais I'm doing well and I feel as if my grandma praised me. "There is not much fish here in the mountains. Our food staples are meat and vegetables". This pork and fig rolls is one of our specialities. We roll thin slices of pork neck with dry figs presoaked in white wine, guanciale and Calabrian pecorino cheese. Color them in olive oil and then braise in white wine with rosemary, bay and garlic. I never tried cooking pork with figs before and the combination turns out to be brilliant. "Have a taste" - she fishes glossy dark rum figs out of a jar. While they are in season they preserve best whole figs like that and the rest just dries in the sun. We go back to the hotel and sit down at the terrace for dinner right at the sunset. We drink rose wine, which is everywhere in Calabria in the summer. Eat warm bruschetta made of Tessano Calabrian bread, unique but in a way similar to ciabatta, and fresh ricotta cheese with Calabrian grape jam (mostarda d'uva). Warm peperonata and fried aubergines with breadcrumbs - all typical summer vegetable starters. Patrizia brings out gnocchi al ragu and pork rolls we cooked earlier. Sits with us for a moment and watches our happy smiles. Then she joins Barbieri family table. A table which brings the whole family together every evening. Even if it's just for a little while, they always sit down all together at the end of another rich day. And we can't help watching them and thinking more and more that this way of life is something we always dreamed about. Soak the figs in wine for 30 minutes to one hour. Drain (keep the wine) and slice thinly. Sprinkle pork slices with breadcrumbs and grated cheese. Lay over some mozzarelly, guanciale and figs (live some for the sauce). Starting from the shorter side make tight rolls and fix each one with 2-3 toothpicks. Heat some olive oil in a large pan. Add the rolls and brown them on high heat from all sides. Add rosemary, bay leaf, garlic clove, salt and pepper to taste. Pour in the wine, let it come to boil and cook under lid on low heat for 10-15 minutes. Transfer the rolls to a serving plate, living juices in the pan. Sprinkle the juices with flour and stir well. 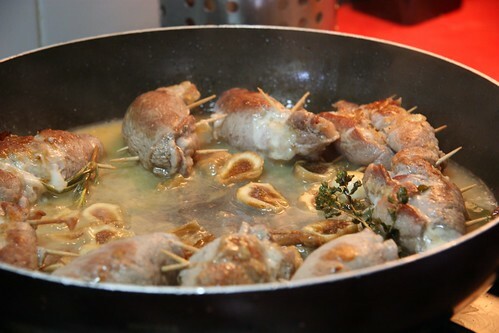 Pour in 1/2 cup of water, add the remaining figs and cook until the sauce thickens. Spoon the sauce over the rolls and serve. 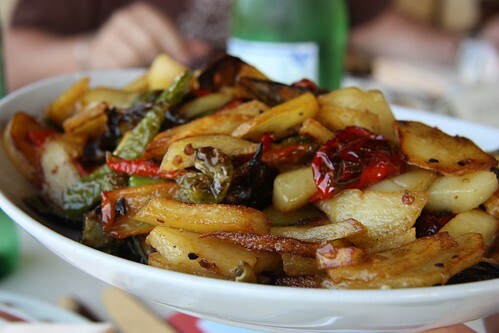 Roast potatoes or peperonata can be a good complement.